Roof Restoration in Miami, FL, Florida with Hialeah Roof Repair will be with the latest methods and industry standards available. Hurricanes and other storms can severely damage your roof, particularly if you live in a low lying area like Miami Beach. Homeowners who are victim of severe roof damage can experience anything from missing tiles to broken or cracked tiles to full roof tear offs. It runs the gamut when a storm comes through you are at the mercy of Mother Nature. Once the roof starts leaking the clock starts running and the price tag for repairs climbs as to what damage can happen. Without a proper Storm Restoration Roof Inspection there is virtually no way to know the extent of the damage. This inspection encompasses the entire set of issues. Roof Damage, Ceiling Damage, Leaks, Structure failure, Mold and more. Miami Roofs age with time some a bit faster than others do to the high wind and stress of frequent storms. Just because during one storm you're only luck that you need a roof tile replacement and nothing further, doesn't mean without routine maintenance you know that several tiles have become loose and cracked after weathering the storm completely. Your roof ages just as we humans do. We need check ups and so do our roofs. Before going it alone. After a storm or after years of wear. Call us for a Free Inspection to ensure your roof is safe and will provide your family with the shelter they expect. Once the inspection is concluded we'll let you know what repairs if any need to be done. Allow us to bring back the luster and integrity of your roof. Let us bring it back to when it was Brand New. We'll repair any "minor" impurities, Replace cracked tiles and Freshen your Roof to prolong the life of your roof and maintain the value of your investment. Home maintenance is an important part of home ownership. It protects and maintains the value of your biggest investment in life, Your family home. 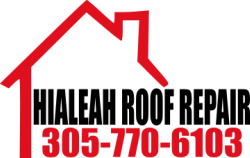 Trust Hialeah Roof Repair to help you maintain that investment. Is Your Roof in need of a Makeover? Did it weather the storm?